Hooray! 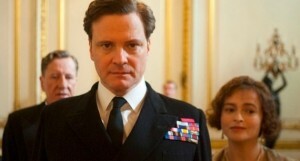 Colin Firth’s latest film is out now and it’s a perfect addition to the Anglofilmia timeline. “After the death of his father King George V (Michael Gambon) and the scandalous abdication of King Edward VIII (Guy Pearce), Bertie (Colin Firth) who has suffered from a debilitating speech impediment all his life, is suddenly crowned King George VI of England. With his country on the brink of war and in desperate need of a leader, his wife, Elizabeth (Helena Bonham Carter), the future Queen Mother, arranges for her husband to see an eccentric speech therapist, Lionel Logue (Geoffrey Rush). After a rough start, the two delve into an unorthodox course of treatment and eventually form an unbreakable bond. With this cast, it’s bound for success. It’s currently at 93% on Rotten Tomatoes and there’s already whispers of Oscar nominations.